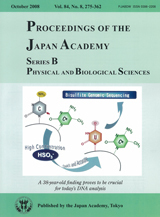 The illustration in the cover of this issue shows the principle of a method used for analyzing the methylation of genomes at position 5 of the cytosine residues. The bisulfite-mediated cytosine deamination was discovered in 1970 by Dr. Hikoya Hayatsu’s group, and by　Dr. Robert Shapiro’s group, independently. Importantly, Dr. Hayatsu and his coworkers also reported that 5-methylcytosine was deamininated only very slowly. The key process of the reaction is rapid attack of bisulfite at position 6 of cytosine (indicated by a red arrow in the illustration), but not of 5-methylcytosine. These findings were utilized to devise a means to distinguish between methylated and unmethylated cytosines in DNA and eventually lead to the invention by a group of Australian scientists of “bisulfite genomic sequencing”. Treatment of DNA in solution with bisulfite results in deamination of cytosine to form uracil. 5-Methylcytosine resists the attack of bisulfite and remains mostly intact during the complete conversion of cytosine residues. The bisulfite-modified DNA may then be amplified by polymerase chain reaction (PCR), and the resultant DNA molecules produced be subjected to sequencing. The methylated cytosine residues in the original DNA will end up giving cytosines in the amplified DNA molecules, whereas the non-methylated cytosines in the original will be changed to thymine residues after amplification (uracil behaves as thymine in DNA synthesis). DNA samples of known nucleotide sequences can thus be analyzed by use of this chemical modification for the possible presence and the locations of 5-methylcytosine residues in them. The findings of Dr. Hayatsu’s group have made it possible to reveal a variety of cases of so-called epigenetic gene functions in biological events including human diseases. 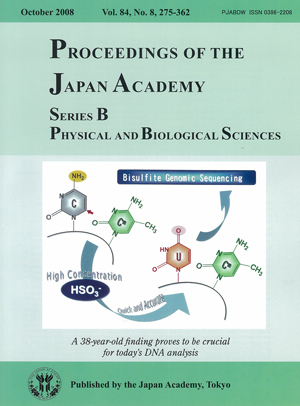 The review by Dr. Hayatsu on page 321-330 of this issue describes how this important chemical reaction was discovered in 1970 by a group of Japanese scientists. Recent improvement of the method by a rapid reaction using a high concentration bisulfite is also documented in the article.